Yours Truly, Johnny Dollar told the story of the freelance insurance investigator with the "action-packed expense account." The CBS series debuted February 18, 1949 with Charles Russell in the title role. 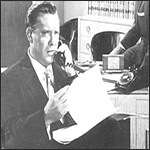 Edmond O’Brien assumed the role in 1950, followed by John Lund, Bob Bailey, Bob Readick and Mandel Kramer. Radio’s last great detective series, Yours Truly, Johnny Dollar ended its run September 30, 1962 during the final week of network radio drama. Bob Bailey, considered by many to be the finest of Johnny Dollar’s impersonators, took over the role when the show changed from a weekly half-hour format to a five-times-a-week 15-minute serial October 3, 1955. Bailey continued in the role after the series reverted to a weekly half-hour format. (7/24/1949) Who Took The Taxis for a Ride? Who Took the Taxi for a Ride?